American flag tattoos are the most popular patriotic tattoo in the United States. Whether you're in the military, a firefighter, a police officer or just plain love your country, a tattoo of the flag can be a great way to show your pride in the US of A. The United States of America didn't always have a standardized flag to symbolize democracy and freedom. Before the Revolutionary War (1775-1783), the American colonies flew the British flag, or a flag that corresponded to each individual militia within a specific colony. In June of 1777, the famous first version of the American flag was adopted by the Second Continental Congress. This showed thirteen stars on a blue background (in a circle) as well as thirteen white and red stripes. While many schoolchildren learn that this flag was originally created by Betsy Ross, most historians believe that this story is untrue, although the image that is said to have been created by Ms. Ross is correct. 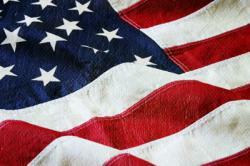 Today's American flag, with it's 50 stars and 13 stripes, was first created in 1958 by Robert G. Heft. He designed the flag as part of a class project, and it was forwarded on to Congress as one potential flag design to be adopted after the acceptance of Alaska and Hawaii into the union (1959). The flag we see today has gone through 26 transformations to come from the original version from 1777. American flag tattoos can be as diverse as the many ways to display the flag. Some people choose to get a very proper and military version of the flag tattooed on their body, while others choose a more stylized tat. Enthusiasts of particular parts of American history may choose to get American flag tattoos of the version of the flag that was flown at that point, such as the versions from the Revolutionary or Civil Wars.Some choose to have their flag tattoos look as if they were a copy of a flying flag, while others prefer the still versions that are usually seen as patches on military uniforms. 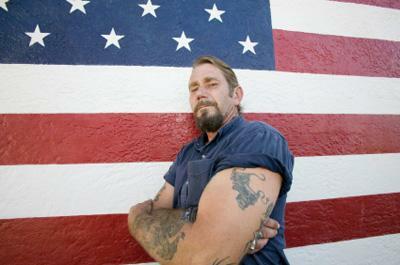 Still others choose to accent their American flag tattoos with other imagery - eagles and crosses are popular additions. Flags are often included in memorial tattoos as well. Still others choose to have the American flag tattooed on their bodies along with the flag of their homeland, especially those who immigrated to the US from European countries. Many flag tattoos were inked on individuals after the September 11, 2001 attacks on the World Trade Center. People chose to get these tattoos for a variety of reasons - closure, the loss of a loved one, or belief in the strength of the United States and camaraderie. These tattoos commonly show the image of the WTC silhouetted on the flag as well. There are a few images that do not go well with American flag tattoos, and these should generally be avoided. It's usually frowned upon to see an image of the US flag burning, so coupling a flag tattoo with flames is a no-no. Additionally, the depiction of mistreatment of the flag (people stepping on it, a tattered image of the flag) is also not seen as respectful.